The Killing Cross is out! The much-anticipated (at least in my own mind) follow-up to Redcoat is now on sale. It features historian Emma Eaton and her wheels-off band of sleuths: Sister Gertrude, Mitch, Gibraltar, Zip and Allie. This time her boss at the Foundation, Chris Moran, sends the gang on an impossible quest: find a legendary and priceless gold-and-jeweled cross rumored to be hidden somewhere on the grounds of Gladewood Plantation. There’s one catch. A ruthless and relentless rival has stumbled upon an important clue from the past and already has a head start. But as Emma picks up the trail, she awakens a darker, more sinister foe that may be hiding the cross and a secret so devastating, it’s worth killing Emma and her friends to protect it. If you like a good treasure hunt, a touch of mystery, history and humor, then grab a copy and enjoy. As always, thanks in advance for your interest in my books. As a lover of mysteries, history, south Louisiana and general mischief and mayhem, I'm always thrilled to get one of these stories down on paper. Or pixels for you e-book fanatics. I'm going to stick with Emma and her crazy friends for a while. Which is why I'm already well into her next adventure: Last Island. I won't tell you what it's about yet, but if you liked Fort St.Jesus Bait and Tackle, I think you'll like Last Island. Redcoat is now on sale! A British diplomat is murdered in the French Quarter, run through with a sword. In his hand is a metal button from a 200-year-old British Redcoat’s uniform. The FBI and Scotland Yard suspect this is no random murder. A panicked city thinks a ghost walks among them. But the authorities aren’t so sure, and they turn to local historian Emma Eaton for help. She reluctantly pulls herself away from a major restoration project at a dilapidated plantation home. Joining her is her eclectic team of researchers: ex-NFL defensive lineman and archaeologist Gibraltar Jones, salty-tongued old nun Sister Gertrude, and dashing Scotland Yard Inspector Tony Spencer. As the body count rises, they begin to connect the murders to the fate of a missing British soldier from the Battle of New Orleans and to a prominent New Orleans family who may have secrets to hide. But as Emma unravels more of the mystery, it puts her closer to an unbelievable truth, and the point of the sword of The Redcoat. 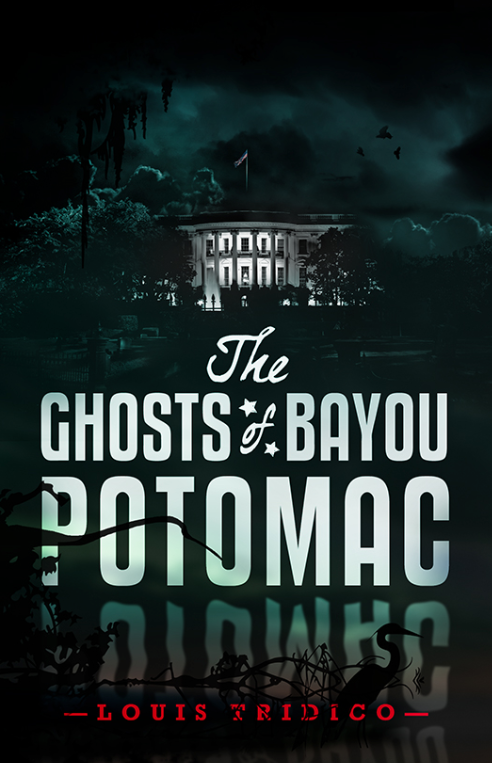 The Ghosts of Bayou Potomac is now available! If you need a little ghost story to get you in the mood for Halloween, try this one. Instead of strange noises in the attic, though, you'll get the first Cajun president wrestling with a looming military confrontation with China, the ghosts of past presidents showing up, and a plot to sneak a voodoo priestess into the White House to get rid of them. But is that the right thing to do, or will it set off World War III? Get The Ghosts of Bayou Potomac now in paperback or e-book and find out for yourself. "President Beau Bergeron's rookie year in office is turning out to be more than he bargained for. An aggressive Chinese admiral is pushing for a big naval showdown with the U.S. Fleet in the South China Sea. And if that's not enough to occupy Beau's time, the sudden appearance of the ghosts of past presidents is about to push him over the edge. While they dole out advice, drink his beer, play practical jokes and ogle the first lady, Beau tries to figure out if his predecessors are helping him or pushing the country closer to war. His crazy college buddies aren't helping, either, as they hatch a plan for a little bayou-style ghost busting -- if they can get past the Secret Service. Can America survive the weekend and the Ghosts of Bayou Potomac?" The Ghosts of Bayou Potomac will be available in print and e-book format. Look for launch-day news soon. It's been a busy few months getting this new thriller series launched. "Draken's Fire" and "Viper" feature Doug Malone, a former Delta Force special ops soldier who has "retired" to his native Louisiana as a charter fishing boat captain. But his former contacts at the Pentagon, the CIA and the FBI always seem to need Doug for a special kind of charter job. That's when Malone's other business goes into action. It's "High Ground," a security and intelligence-gathering outfit based in the New Orleans French Quarter. Doug's other partners are Ike "Gunny" Davis, another retired special forces friend, and Rhonda "Drop Dead Red" Howard, an ex-New Orleans homicide detective. Together they get caught up in one adventure or another in the service of king and country. These books are novellas, or short novels, and are available only as e-books on Kindle, Nook or iBooks. I've got three more Malone thrillers in the pipeline. Look for the next one, Flashpoint, later this year.